Being a guy I felt weird about going in there to have my toes “done”. But I had a toenail that was driving me crazy. Amanda did an excellent job, I’ve had doctors working on my feet that were painful and I was concerned about that. She never once made me flinch. Very pleasant experience. I’ll go back. I was delayed by traffic and was still taken care of. Fantastic atmosphere….friendly people. Your people rock! Especially a Dottie. 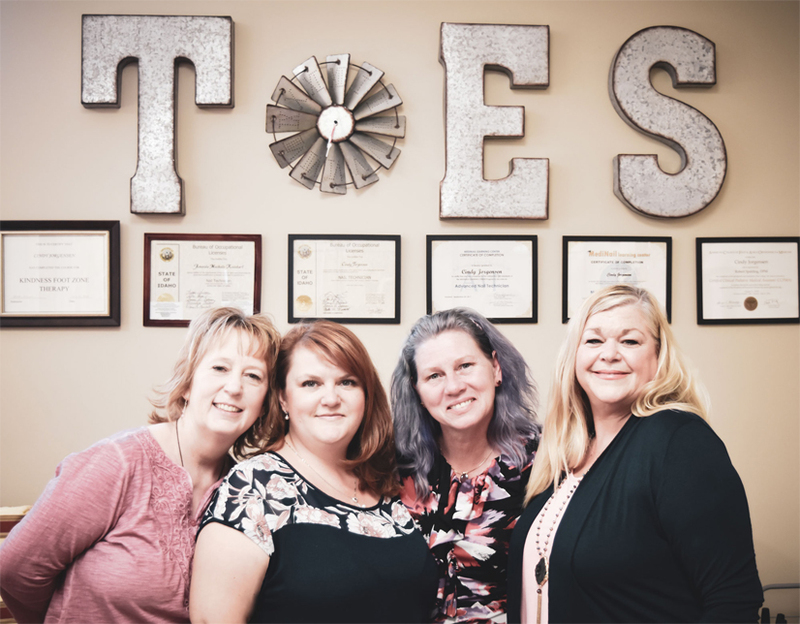 A welcoming environment with the best trained foot care specialists! I am so grateful for amazing foot care! Wait Time, Customer Service, Quality, Environment, all of the above even though I had the time of my appt. wrong. Spoiled rotten – never had such t.l.c.! I was floating on air when I left this fantastic place. What great staff too. I’m thankful they willingly work with old, worn-out feet! Very friendly staff and Amanda was able to work me in on short notice! Again thank you and my feet feel great. Always up beat, friendly and caring. I’m so thankful I have found you. Absolutely a step above any other pedicure I have ever had done. Thanks for caring! Dottie is delightful, caring and kind. On time and wonderfully done. Friendliness, care & experience- all were top notch! Will be back in 2 months! Dottie was great. She explained what was happening and offer ideas for remedy w/o being pushy to sell us anything. Quality, Wait Time, Customer Service, Other, & Environment. It is such a blessing to have your services available. Always treated with kindness and respect. Thank you so much for your quality care. I tell everyone I know about your service and how well I am treated at each appointment. No wait time. Technician was very knowledgable regarding the spcific problems with my feet. I was searching for someplace that offered services other than basic namicures to make toes pretty. I need more and I found it at Tending Toes. Very nice salon. I especially had a great pedicure from Dottie Freckleton. Amanda and Dotti are absolutely THE BEST. Thank you so much for taking care of my 89 year old mother. She loves you Ladies. It’s more like visiting family than going to a business. Great focus, excellent care. Wonderful experience. Thank you so so much!! Our seniors deserve to be pampered! A place for old farts & sassy tarts!